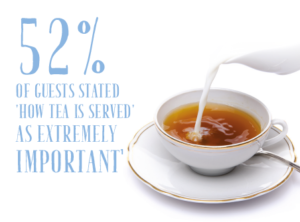 With research suggesting that guests are willing to spend more on a cup of tea in the hotel sector channel – at £2.33 per cup, higher than any other – hot beverages can provide a lucrative revenue stream for operators within the accommodation sector. With this in mind, CIS Excellence Independent Hotel of the Year sponsor, Tetley has developed a range of solutions ideally suited to the needs of accommodation providers, in addition to its Accommodation Tea Guide. Packed full of tips designed to improve serving techniques and showcase ranges, this specially prepared guide also assists operators with advice on display and marketing solutions for the hotel sector. Senior brand manager, Marshall Kingston, said: ‘With Tetley one of the leading tea brands out of home in Scotland, we’re delighted to offer our support to these prestigious awards. We’re really looking forward to the event and meeting some of the leading talent in the Scottish hospitality industry.